For the first time, you can set your look with a naturally luminous finish. We infused our Translucent Loose Setting Powder with a custom blend of pearl pigments to lock in your look for 12-hours. Custom pearl blend creates a radiant finish with a touch of sheer coverage that resists settling into fine lines and pores. Keeps makeup in place for 12 hours. This lightweight, innovative powder doubles the wear of foundation without adding weight or texture. This no-flashback formula is perfect for photos and creates a soft-focus effect to subtly blur the look of fine lines and imperfections without looking cakey. Apply with the specially designed Glow Powder Brush (sold separately) to set makeup flawlessly and prolong wear. Sprinkle Translucent Loose Setting Powder - Glow into the product lid. 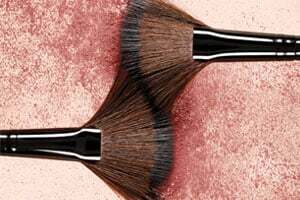 With the top curve of the Glow Powder Brush, pick up product and desaturate on the back of your hand to distribute powder evenly through bristles. Sweep and buff all over the face to set. •Pat down to matte, brush up to glow. Set makeup and create dimension by artfully applying the two finishes of TLSP, matte to recede and glow to reflect, on specific areas of the face. •Set makeup and reduce the look of unwanted shine and texture. •Determine the areas you want to set down—these are typically places you want to recede, areas of texture, or areas of high shine. •Using Laura’s Velour Puff, press and roll original Translucent Loose Setting Powder on those areas, including the forehead, lower cheeks, sides of nose, around the mouth and chin and lower jawline. •Set makeup and reflect light on the high points of the face to create a natural glow. •Determine the areas you want to set up with luminosity--this is typically where skin is naturally smooth or where you want to catch the light. •Using the Glow Powder Brush application technique described above, apply TLSP Glow on the areas you want to set with luminosity—this can include the temples, cheek bones and apples, bridge of nose, and cupid’s bow.